So now I’m about to fly out to China for 5 days – probably the last of my international trips for 2010. I may not see you here on BNC until I get back to Australia, because WordPress blogs are blocked by the ‘Great Firewall of China’. It is possible, though difficult, to punch through this, but I honestly doubt I’ll try, since I have so many other things on anyway. Meanwhile, here are two things to talk over on BNC. I suggest you print some of these out, and have them on hand to pass to people when you wish to talk about climate change and energy solutions. If nothing else, it’ll get people thinking (and reading BNC!). A good place to start handing them out is at the Walk Against Warming event, this coming Saturday. 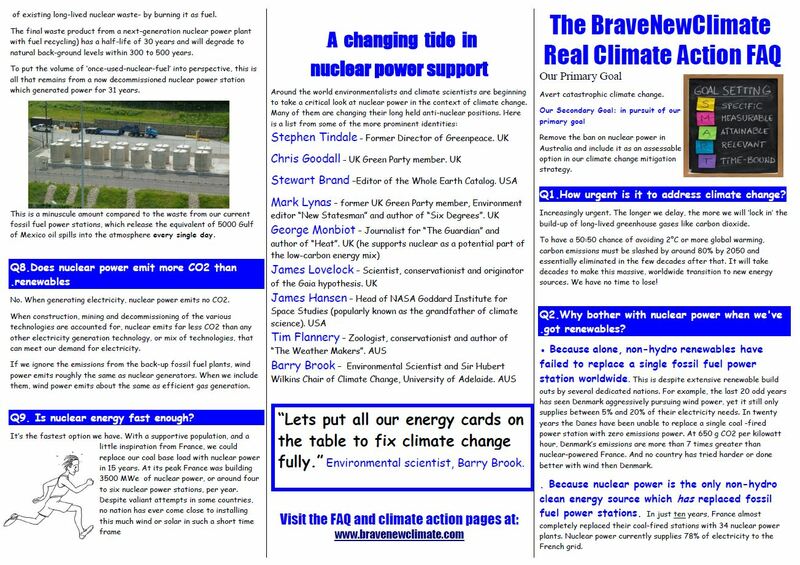 Second, I’m very proud to distribute a new information pamphlet on nuclear power and climate change. It was created by my sister, Marion Brook. She calls it “The BraveNewClimate Real Climate Action FAQ”. It is designed to be printed, double-sided, and then folded thrice, to create a 6-panel, single-sheet pamphlet. It’s just brilliant (! ), and relates directly to the more extensive FAQ material collected here. This would also be a great bit of paperwork to hand out in the Walk Against Warming, or to leave at your local doctor’s waiting room or other public places where information pamphlets are generally left. Oh, and if you find any typos or errors, let us know and we’ll create a revised version. Finally, I should note that this pamphlet is targeted towards an Australian audience. Ideally, its core information should be readily available for a broader international audience. In this spirit, I’ve already had a volunteer to create a US-oriented version – and when that’s ready, I’ll post this up on BNC also. But if you live elsewhere, and wish to edit the pamphlet in order to make it better suited to your own country, then that would be great. To do this, just email me and I’ll send you the Word document version. Then edit it and send me back the revised, country-specific version. I’ll then upload it to BNC (after checking it) and provide a permanent link to it on the FAQ page. Let’s continue to build the BNC community and get the message out there – there are real solutions to climate change and sustainable energy. Barry, Please don’t try to get around the Chinese firewall..I can’t stand the thought of someone who is quickly becoming one of my favourite bloggers ending up in a jail out there! Thankyou for putting this pamphlet together. Its a very good summary and your timing is excellent for Sunday’s “Walk Against Warming”. I’ve printed some out on my black and white printer and the images are quite acceptable in this format. .got renewables?”, and … oh, it looks as if any of those headers with a line-break in it has that dot at the line-break. Maybe the PDF editor requires this. “Isn’t radiation a concern” is numbered Q6, and “What about meltdowns” as Q5, which is opposite to the order they are in in the columns. Would suggest some Sydney dwellers get themselves down to the Beyond Zero Emissions, Zero Carbon Australia 2020 launch & take some copies of this FAQ pamphlet. Apparently Clover Moore is supporting it and wants to get Sydney running off 100% renewables. You have been warned. Get ready for an expensive & unreliable electricity future for Sydney. Get yourselves down there and ask those difficult questions…. What’s keeping French Emissions so high (90g/Kwh)? Well done Marion … and just in time for Sunday! fyi, those cards were free cards (except for postage) which I did through the free business cards at http://www.vistaprint.com.au/. Anyone can do it, though probably not in time for Sunday now. They arrived last week and look really great on the glossy stock – very professional. Great pamphlet Marion! Well done! Don’t get yourself locked in your hotel room for a week like I did. I had some thoughts on improving the business card, in the spirit of sitting around a table at an ad agency tossing ideas around. “the inconvenient solution” seems a play on Gore’s “inconvenient truth”, but what does it convey? Nukes are inconvenient, i.e. hard to reach, compared to forcing everyone to spend all their money implementing a more expensive solution…. or is it nukes are inconvenient because, duh, powering civilization with them is not accessible and hard to reach? 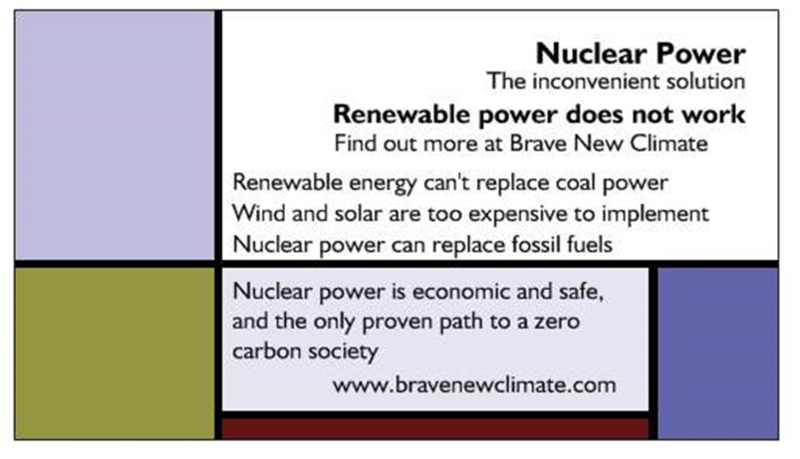 So, like nukes are the inconvenient solution because we like living without reliable power? Or is it nukes are the inconvenient solution because they aren’t suited to the purposes, needs or comfort of civilization? Nukes are the inconvenient solution because we’ve been flogging solar so long? Nukes are inconvenient because they aren’t what we need? Gore’s use of the word seemed appropriate. It is inconvenient to face the reality of climate change. What is inconvenient about nuclear power? Its inconvenient for us if we can’t face the fact that renewables are at the moment way too expensive. I see too much information on the card and some of it is conflicting. Renewable energy either can’t replace coal, or it can. The card says it can’t. If it can’t, why say by the way renewable energy is too expensive? Nukes can replace fossil fuels followed by nukes are the only proven path to a zero carbon society seems repetitious. What I might put on the front of a card is some reference to Brave New Climate and the fact it is a website where readers of the card could find out more, and for the “about what”, I’d look for a phrase and graphic to convey that at BNC, environmentalists or greens facing what to do about climate change are deciding nukes could be a big part of the solution. You’re doing a good job promoting nuclear electricity over windmills. Excellent as it is the pamphlet doesn’t appear to allude to another reason for nuclear power; fossil fuels are running out. Q1 talks of 80% emissions cuts by 2050 which some believe will happen regardless. A recent paper by Patzek and Croft is behind a paywall but is summarised here. That is other things being equal coal based emissions will be half what they are now and there will be minimal oil production by mid century. I’m confused whether Tim Flannery is actively pro NP. I thought he also supported ZCA which pointedly excludes NP. While not named on the pamphlet Clover Moore evidently endorses ZCA. That contradicts earlier moves for Sydney to convert to combined heat and power based on gas, again not ZC. Some of these leading lights should clarify their position. Thanks for the positive responses. I’ve sent Barry the suggested corrections – plus some others I’ve spotted – with luck they’ll go up before Sunday. John, I think your business card is terrific. What a great idea! David, perhaps you could devise your own version of the card. We each understand the approaches that will work best for our ‘tribe’. The more diverse our approach the more people we will reach. Luke Weston (spelling?) suggested a Facebook page some time ago. I just don’t have the wherewithal at the moment, but if anyone else does, it would be a great initiative. David Lewis, thanks for those comments. I’ll let JM decide how he may take them on board. To me, the “inconvenient solution” refers to the fact that many environmentalists have long campaigned against nuclear power because they considered it ‘dirty’ and a threat. Now, climate change presents them with the greatest and most tangible threat ever faced by society and the environment it seeks to protect. However, it is now clear that the best hope of staving off climate change, which most profess to care greatly about solving, is the very thing they spent so much of their time protesting against and trying to get shut down. Nuclear power. How inconvenient. David Lewis, I keep looking at the card and thinking of things I would change to make it better. First thing I’d do is drop the words ‘to implement’, which is unneccesary verbiage. You suggestions are good, but in this case I could not alter the format, the layout, or the character count for the text fields, so I was highly constrained in what I could say and how I could lay it out. That’s what you get for being a cheapskate. Still, its free, so why not have a crack at it yourself? Go to the website, lay it out, grab a screenshot and put it up at imgur or elswhere. I’ll probably do another batch when this lot gets distributed so any improvements are welcomed. The inconvenient solution? Its a riff on Al Gore’s film title. In the same way climate change is an inconvenient challenge to our complacency in our comfortable fossil fuel powered lives, nuclear power is a challenge to environmentalists complacent acceptance of nuclear power as a convenient bogeyman. In each case, its the inconvenience of a new idea that will force changes to our thinking. Thankyou Marion for your hard work and the brilliant pamphlet. I shall be printing some out to take along to the WAW in Melbourne. My husband (the artist in the family) is preparing a banner for me to (boldly) carry – it is an enlarged version of Poster 4 Nuclear power means climate action. See you and any other BNCers there I hope. You guys are working hard on the print material! Sorry we can’t right now: too busy. Maybe if things quieten down in months to come. I love the thought that went into the brochure and card. Could the card be rigged up with multiple copies on an A4 page and include a photo of Barry? Print a page, cut them out, and keep them in your wallet. You’re always ready to go then. I’d love my lady to have a go at the brochure Marion’s written, but she’s just too busy for the next month or so. I doubt she’ll get to sleep before 2am this week! Maybe in a month or so? Anyway, keep up the great work all! I think people might be a bit confused by the talk of capacity factors in the costing part. I don’t think many people, even greenies, will know what it means. To all Sydney siders especially, I just spoke with John Morgan and we are definitely turning up for the WALK AGAINST WARMING on Sunday in Belmore Park opposite Central and bordering Eddy Avenue. We haven’t yet heard from any other BNC contributors and we really think it’s very important that our nuclear message get out into the community. We would also just like to meet others of similar conviction in the flesh! – clothed or unclothed. My wife Ann and I are getting the train to Sydney from the Southern Highlands and we suggest we meet at 11.45am at the South Western Corner of Belmore Park. The Sydney Walk will leave from Belmore Park (next to Central Station) and head up Elizabeth Street to Bathurst Street. At Bathurst Street, we will walk down Castlereagh Street into Belmore Park. I’ve even made a poster, have tee shirts and promise to be just soooo nice on the day! It’s sad seeing a climate scientist stoop to this level of dishonest FUD and propaganda. What I think is sad is comments like this. There is ample material on this site, in particular the TCASE series clearly articulating some of the main issues with renewables. Likewise there is a wealth of material on the sustainable nuclear option. If you disagree with any of it, then you really should articulate what and why. Name calling is not good enough. And neither is quoting newspaper opinion pieces. Good intentions will not solve the climate problem. Clear, critical thinking is an absolute prerequisite. people should read the independent letter from the scientists. it’s a total crock, distorting the true LCA ranges for nukes and renewables, distorting capacity factors, asserting peak uranium, etc. so how do we determine whose account is FUD and whose account is not? work and study, which David has not done. He’ll be another drive-by-shooter that will take his cheap-shot and move on. He won’t stay and engage like I did. Staying and engaging in conversation about these matters is dangerous. It might unpack ideology and expose it for what it is: mushy sentimentalism. DavidCOG, if you are just another drive-by, then shame on you! Come to think of it, the post title on its own, “Climate change or nuclear power: take your pick”, would make a snappy T-shirt. There are probably Aussie places to do this as well. Give us a month or so to get to it though. Remind me later. If there’s interest, and if Barry’s OK with the URL being included, I’ll set up some T-shirts via CafePress (or Zazzle or similar). Matt – I designed a poster, saying the same thing as your T-shirt, to take with me to Sunday’s WAW. However, on reflection, I thought it sounded as if we were saying that you had to make a “Hobson’s” choice between two equally horrendous outcomes and that is NOT what we want to get across. I believe the Greens would, pounce on it and deliberately misconstrue the meaning. I settled on a simple poster – “Nuclear Power = Climate Action” – more positive I think – and other members of the group going with me to WAW agreed. I just thought I’d post to let you guys know that I’ve decided to go for the Nuclear option. I went to an interview the other day and I’ve been accepted onto a masters degree course to study Nuclear Reactor Technology. I will be studying the design and engineering of various nuclear reactors, waste management, etc (I was also told fast reactors make up a large part of the course). Thank you to everyone on this website who helped me make my decision. The articles written by Prof. Brook and Peter Lang I found hugely informative. Also, a big thank you to DV82XL, Finro, Eclipsenow, gallopingcamel, Huw Jones (who brought me to this site) and others on here – reading your comments helped me make up my mind. The tipping point for me was the article by Barry’s article on material inputs for Renewables vs Nuclear – there’s no way we are going to produce that much steel and concrete. Also reading about the ‘jevons paradox’ was also a revelation for me. Anway, just thought I’d let you guys know, as a large part of my decision was based on this website. When I graduate, maybe I can share what I’ve learned with you guys! Well Matt, I’d wear it. DavidCOG, on 12 August 2010 at 5.27 — Intermitent so-called renewables can be encourporated into an electric grid up to some percentage depending upon available backup. Around here that’s wind up to 20% (although that high will not be easy). The least expensive option is energy efficiency and in many parts of the developed world about 30%, someplaces even 50%, of future demand can be offset by fairly inexpensive energy efficiency measures. I especially appreciate the many advantages of the forthcoming miniNPPs. Awesome news mate. I hope you can make the industry even more cost-competitive and safe. Who knows, in this era of exponential technology, what will eventually end up being our main power source 100 years from now? But for today’s technology Barry has convinced me that nukes are our only really viable option in the current energy and climate crisis. @Ms Perps: thanks, that’s an insightful observation. I take your point, that the “take your pick” line implies that nuclear is a difficult/painful/costly choice, comparable with the effects of continued warming. There’s a place for many approaches; while a less confrontational approach is certainly valuable, I think there’s worth in presenting it like this as a tough choice, not so much in terms of the actual technical difficulties/costs of the nuclear option, but in terms of the psychological/political inertia that we have to overcome if nuclear is to be adopted quickly enough. I hope this indicates that people need to investigate further to make an informed decision. Comic sans? Are you serious? That’s like doing a press conference with undies on your head. Otherwise neat pamphlet. @ AC: I love Marion’s ideas and writing, but I agree. Sorry we’re too busy to help now Marion, but in a month or so we might have another go at that poster for you OK? @AC – undies on your head would make an impression and get you noticed. BTW- EN and AC – change the font if you don’t like it – BUT you still have to make all the information fit on the double-sided sheet. Try it – it aint easy! Hey, Marion’s done a lot of work on poster development and pamphlet writing. I’m not having a go at her personally. We’re just too busy right now, with the good wife staying up till 1am often to get jobs out. Maybe down the track we’ll have a crack at it. That’s great EN – a joint effort is needed and appreciated – when your life is back to normal. This latest one is great! Have you set them up somewhere as t-shirts yet or are you waiting for Barry’s OK? Thanks, Marion; I haven’t yet set them up as T-shirts etc, but it’s pretty quick and easy to do. Yes, waiting for Barry to give the nod to including the URL. I just thought I’d post to let you guys know that I’ve decided to go for the Nuclear option. I went to an interview the other day and I’ve been accepted onto a masters degree course to study Nuclear Reactor Technology. Good for you, Tom. If I was a bit younger (like about hald my current age), I’d seriously consider doing the same thing. Best of luck with it all. Yeah, I’ve got doubts about Flannery as well. When I fronted him here in Port Lincoln a few years ago HE CERTAINLY WASN’T PRO NUCLEAR. I gave him copies of Colin Keay’s booklets to help him get the truth. Lo and behold, a few weks later he comes out in support of nuclear and especially Australia getting into nuclear waste disposal. Now he seems to have changed his mind again. He’s all over the place in my view and I’d leave him right out of the pamphlet. I would like to share some of my other experience with him but time and space don’t permit it. Let’s just say that I don’t have much time for him despite his widely acclaimed writings and public utterances. I’ve set up a CafePress outlet for these called ClimateSanity, where I (and anyone else who feels so inclined) can buy them on T-shirts, caps, bags, dog T-shirts (! ), water bottles, etc etc etc etc. I have no interest in making profit from this; I’d be happy to donate all those rivers of gold (hah!) to some suitable organisation. Suggestions? Congratulations on a great job with the merchandise Matt and thankyou very much for your hard work. Barry – could we have a link to the ClimateSanity website, and examples of the products, on our FAQ/Climate Action page? 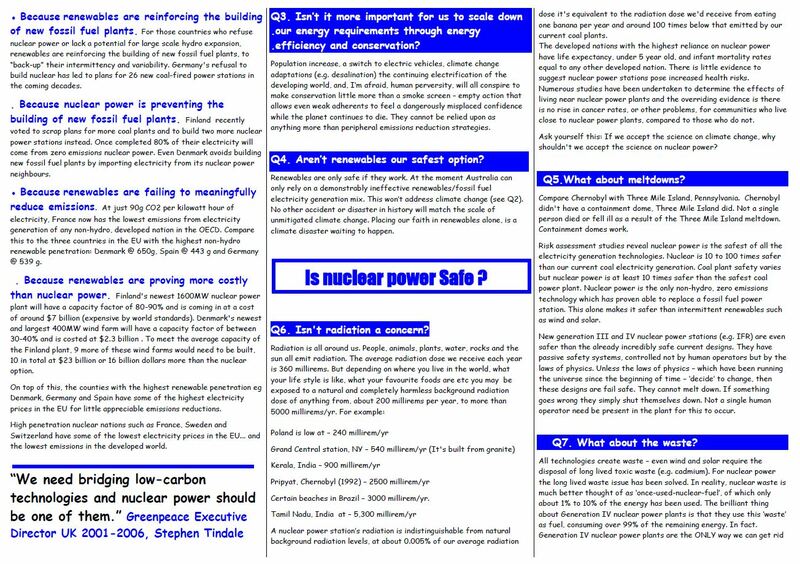 I’ve made a few changes to the pamphlet, primarily a font change, but since this allowed a little more space I’ve also rewritten Q4 “Aren’t renewables the safest option?”. I agree with JM, the “renewables don’t work” line (which was my original approach) could be a bit off putting if it’s the first time you’ve ever been asked to consider their real efficacy. I’ve been leaving a small stack of pamphlets at the train station each week and they are all gone by weeks end. I suppose this means, at the very least, people are interested. As an activist my thing is efficacy of action, or maximum bang for your buck. This is why I prefer posters, as depending on the location, a few hundred people might see the headline, a few dozen might stop and read it, and a handful of people might tear off the little tear-off tabs and take them home to investigate online. In other words, if you’ve got a budget, go for the pamphlet. But if you’re money is limited, sticking up one poster can send a message to a good number of people. How do we get the uni-kids in on this? @Ms Perps: thanks. I’ve added a couple of variations using white text for use on dark coloured clothing. If anyone has suggestions for other pithy phrases which would work, I’d be happy to add them. I talked to Barry and Marion about the “Nuclear Power or Climate Change – Take Your Pick” slogan and we thought that substituting “You Choose” for “Take your pick” implied that some careful thought and maybe reseach should be applied before answering. Maybe “Take your PIck” could be taken to imply that the choice was between two equally horrendous propositions. What do you think? Maybe offer both versions on the T-shirts etc.? These are three of the posters we designed – do you think any of these may be worth using as well? I have been a long time believer in nuclear power as one of the necessary solutions to GHG emisssions. Jim Green is a well-known anti-nuclear activist. The claims made in the linked paper are just more of the same old anti-nuke bluff. They’ve been comprehensively disposed of in various threads here and elsewhere. Thanks then I will have a detailed read of what’s here as time permits. @Ms Perps: thanks again for the feedback and suggestions. I agree re “You choose” (after taking the opposite stance earlier!) – it’s better. I’ve changed the designs accordingly. I’ve also added a “Nuclear waste. It’s not the problem, it’s the solution.” design (with an alternative version in white text, for dark coloured clothing, like the others). I was concerned that it’s going to be pretty unclear to 99% of people out there, but perhaps it has the virtue of being a conversation starter as a result.